Browse > Home / Boyle Heights, City of Los Angeles, County of Los Angeles, East Los Angeles (LA City), Eastern Group Publications/EGPNews, Eastside Sun, ELA Brooklyn Belvedere Comet, Featured News, Lincoln Heights, Monterey Park, Monterey Park Comet / Special Olympics Arrive in L.A.
Special Olympics Arrive in L.A. Opening Ceremonies Saturday at the Coliseum. Seven thousand athletes from 165 countries, 2,000 coaches and thousands of volunteers and fans are getting ready to make history at the largest sports and humanitarian event in the world this year: the 2015 Special Olympics World Games. Opening ceremonies for the international competition are Saturday at the Los Angeles Coliseum, with athletic events taking place daily through Aug. 2 at venues across Los Angeles, host city for the World Games. 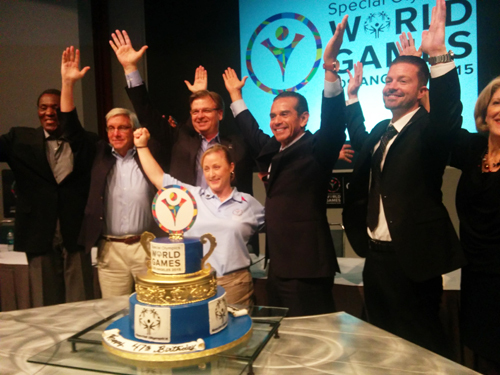 Patrick McClenahan, president and chief executive for the 2015 World Games, said Monday he’s been impressed by the “remarkable” and “incredible community engagement” he’s seen preparing for this “circle of acceptance and inclusion” in Los Angeles. It’s most inspiring, said the 20-year Special Olympics volunteer and proud father of a 28-year-old daughter with cerebral palsy. Founded in 1968 by Eunice Shriver Kennedy and first held in Chicago, the Special Olympics World Games give athletes with intellectual disabilities — like Down Syndrome or Autism-related disorders — the opportunity to showcase their athletic skills in Olympic-style events, including swimming, track and field and cycling. “Nothing is impossible, that’s my personal motto,” Special Olympics gold medalist Debbie Anderson said Monday at a news conference. The thirty-seven-year-old Orange County resident has been involved with the Special Olympics for 17 years, competing in bocce, bowling, track and field and gymnastics. Today, she represents Southern California as a 2015 World Games board member. Special Olympics estimates there are approximately 200 million individuals in the world today with intellectual disabilities and that globally, each year, about 4.4 million of them compete in Special Olympics accredited events. Starting this weekend, athletes will compete in 25 different sport contests ranging from from sailing, to softball to volleyball, judo, soccer, tennis, equestrian, and powerlifting, among others. It’s been 16 years since the World Games were last held in the United States and bringing the international event to Los Angeles is expected to be an economic win for the city. In 2009, then-Los Angeles Mayor Antonio Villaraigosa pushed to bring the World Games to the city, winning the bid two years later. With as many as 500,000 people expected to attend the World Games, stay at local hotels, eat at local restaurants and to visit tourist spots and to shop, Los Angeles could see more than $400 million added to the local economy, said Villaraigosa, a member of the LA2015 organizing committee. “I thought it was a great opportunity for this city, a city where people come from every corner of the earth,” Villaraigosa said. Los Angeles is “the city of miracles, hopes and dreams; a city like no other,” said the former mayor. While Los Angeles is the primary host for the event, there are 85 host towns from San Diego to San Luis Obispo that will house and entertain one or more international delegations of athletes in the days leading up to the main event. The time allows athlete to acclimate to the local climate, and to experience the local culture before moving to the designated Special Olympics housing at UCLA and USC. On Tuesday evening, Cal State Los Angeles hosted a welcome reception for the Germany delegation, whose athletes are staying in host towns Lincoln Heights, Monterey Park and Alhambra until Friday. Today Thursday, as part of the Law Enforcement Special Olympics Torch Run, athletes and officers running with the “Flame of Hope” will make stops at Lincoln Park (Mission and Main Streets, Lincoln Heights), between 8:15 and 9:25 a.m., and at Mariachi Plaza/Metro Gold Line station in Boyle Heights between 12:25 and 1:25 p.m.
On Friday, host towns Monterey Park, Alhambra and Lincoln Heights will hold a Pep Rally in the gymnasium at Cal State LA. The United States’ delegation — 300 athletes strong — on Wednesday moved into dormitories at the University of California Riverside, said the delegation’s spokesperson, Leigh T. Cheatham. However, the event got off to a rocky start Tuesday for some international delegates, with hundreds of athletes and coaches being forced to sleep on a gym floor at Loyola Marymount University due to transportation delays. Special Olympics officials said about 1,500 athletes and coaches who arrived at Los Angeles International Airport Tuesday arrived late, leading to backups at the check-in center at LMU in Westchester. By the end of the night, buses weren’t available to carry the delegations to their respective host cities. Athletes and coaches from Norway, Mexico and England were among those left stranded. Some said there wasn’t enough food available for the people who were stuck at the university, and the Red Cross was brought in to help out. By mid-day Wednesday, all the delegates were on their way to their host cities, according to Special Olympic officials. With the exception of the Opening Ceremonies, all of the events are free and open to the public; parking is $12. The Opening Ceremony will include the lighting of the Olympic Flame: First Lady Michelle Obama will officially open the games. Los Angeles Mayor Eric Garcetti and California Gov. Jerry Brown will serve as honorary hosts. The Special Olympics World Games will be aired on ESPN and across the world in 70 different languages. The 2015 Special Olympics World Games is the biggest sporting event to hit Los Angeles since the 1984 Summer Olympic Games when field hockey was played at East Los Angeles College in Monterey Park. July 23, 2015 Copyright © 2012 Eastern Group Publications, Inc.